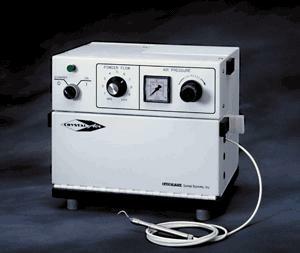 Dental treatments that use a dental drill can make a person hesitate about going through with a much-needed dental procedure; this is because just the thought of having to face the dental drill can cause dental anxiety attacks, as the drill is oftentimes associated with pain, irritating noise, and discomfort. Air Abrasion by a dentist in Kent provides an alternative to the use of a dental drill in the removal of the decayed parts of a tooth (or teeth). Air Abrasion is a gentle spray of an air and powder mix that removes the decayed parts of the tooth. By controlling the speed and the intensity of both the powder and the air, the dentist in Woodbury Dental and Laser Clinic can then make the procedure virtually painless. Since an injection is not necessary in most cases, you will not have numb or drooping lips after the dental procedure. Since Air Abrasion is achieved by directing a thin stream of abrasive powder at the area of tooth decay, the dentist will remove only minimal sections of tooth – focusing on just the decayed area, and preserving the other parts of the tooth that are not damaged by decay. Air Abrasion provides a significant improvement (in terms of the treatment procedure) compared to the dental drill, which has a tendency to remove even the tooth structure that has not been damaged by tooth decay because of its size. 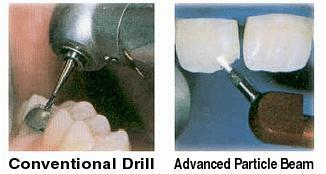 Air Abrasion allows for very small cavity preparations, and is part of what is called MicroDentistry. The cavity that is left from the removal of the decayed part will then be filled with a nearly invisible, non-mercury filling; this filling will make the entire tooth strong, long-lasting, and highly resistant to tooth decay. Air abrasion decreases the need to use anaesthesia on the patient, especially in cases when the cavity left by tooth decay is shallow. Air abrasion by the dentist at Woodbury Dental and Laser Clinic in Kent provides patients with a more comfortable experience, because it does not produce sound, heat, vibrations, or pressure – factors which can all lead to a very uncomfortable experience. Using air abrasion enables the dentist to have the precision to remove only the decayed or damaged part of the tooth – and leaves the healthy tooth parts unharmed, preserving valuable tooth structure. This is a huge improvement when compared to the use of a traditional dental drill, which has the tendency to also remove the parts of the tooth that are not damaged by tooth decay. The air abrasion process is fairly quick, with most air abrasion fillings generally completed in 10 to 15 minutes, or even less. The simplicity and quickness of the air abrasion technique makes it possible for a dentist at Woodbury Dental and Laser Clinic to treat more than one affected tooth in a single dental appointment. Air abrasion decreases the risk of the treated tooth developing small fractures or chips, since there are no vibrations produced – this reduces the risk of restorative measures (such as dental fillings) failing prematurely. Who will benefit the most from the Use of Air Abrasion? Air abrasion by the dentist at Woodbury Dental and Laser Clinic is recommended for the nervous patients, who experience dental anxiety or fear during dental treatments; air abrasion is also an ideal option for those who do not want to face the noise and vibrations that are associated with the use of a dental drill. The use of air abrasion also eliminates (in most cases) the need for a shot or injection, so this option is great for those who are afraid or needles. The use of air abrasion by the dentist for the removal of decayed parts of the tooth will allow patients to go through with the dental treatment, without having to face the bothersome sounds, vibrations, and overall discomfort that can be produced by a dental drill. Is Air Abrasion Safe for Children as Well? Absolutely! Air Abrasion is perfect for children. Most cavities that are detected early can be treated immediately without a drill and without a needle. The tooth is then restored with natural looking materials to strengthen and protect the remaining tooth structure. Most children are not even aware of what the dentist at Woodbury Dental and Laser Clinic is doing, since there are no uncomfortable vibrations, noise, heat, or sound. Fewer dental appointments for the young patient are usually required because with Air Abrasion, many more procedures can be completed in a single appointment.